How can I help my child navigate the world of competition with greater understanding and more fun? Q: How can I help my child navigate the world of competition with greater understanding and more fun? 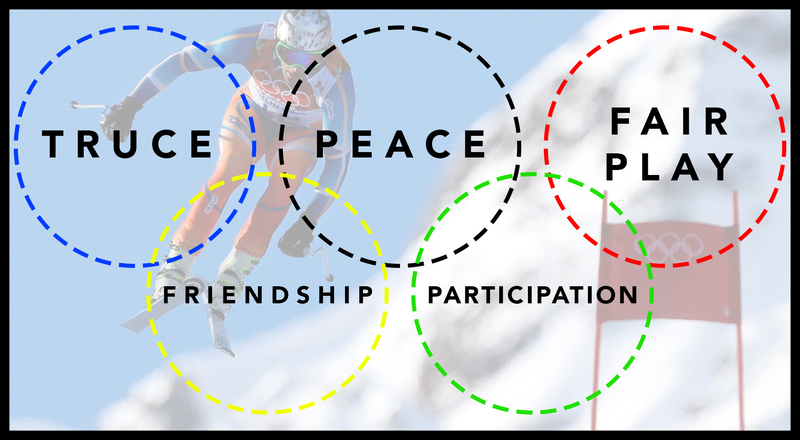 A: With the 2018 Winter Olympic Games coming to an end and the 2018 Paralympics set to begin in PyeongChang from March 8-18, it is an excellent time to discuss how competition and “games” affect us all. The 2018 Special Olympics will be in Seattle from July 1-6 this summer and will provide another rich opportunity for continued conversation. It is certainly not just about sports and athleticism but how we each perceive the interaction between ourselves and our teammates, classmates, friends and family members. For those who have watched, the past two and a half weeks of Olympic coverage have provided moments of suspense, rattled nerves, sheer determination, loss, immense gratitude, relief and joy. We have witnessed inspiring glimpses of positive sportsmanship, team work and even photo finishes! There have been opportunities to cheer one another’s successes as well as comfort those in despair. 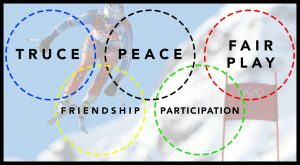 What has been YOUR favorite scene or sensation from these Winter Games? What have your children enjoyed? Questioned? Favored? What lessons can we each take away from this shared global experience? How one chooses to react to these myriad examples can and will inform how our children view themselves. Competition obviously doesn’t just take place on the half pipe or skating rink or bobsled track. It is present in every facet of our lives. Ongoing research continues to remind us of the effects of anxiety and stress on ourselves and our developing children. Every skater falls, every commentator fumbles and every participant has challenges. How each one responds to the ups and downs is the place where learning occurs!! One way to continue the FUN of the Games while furthering the conversation about resiliency and participation can be found in working together on some simple but stimulating crafts which illuminate the spirit of collaboration without the angst or nerves of competition. 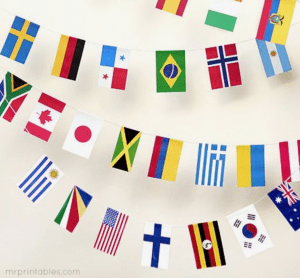 •	Use this printable worksheet to make flags of the world or flags of your own choosing. 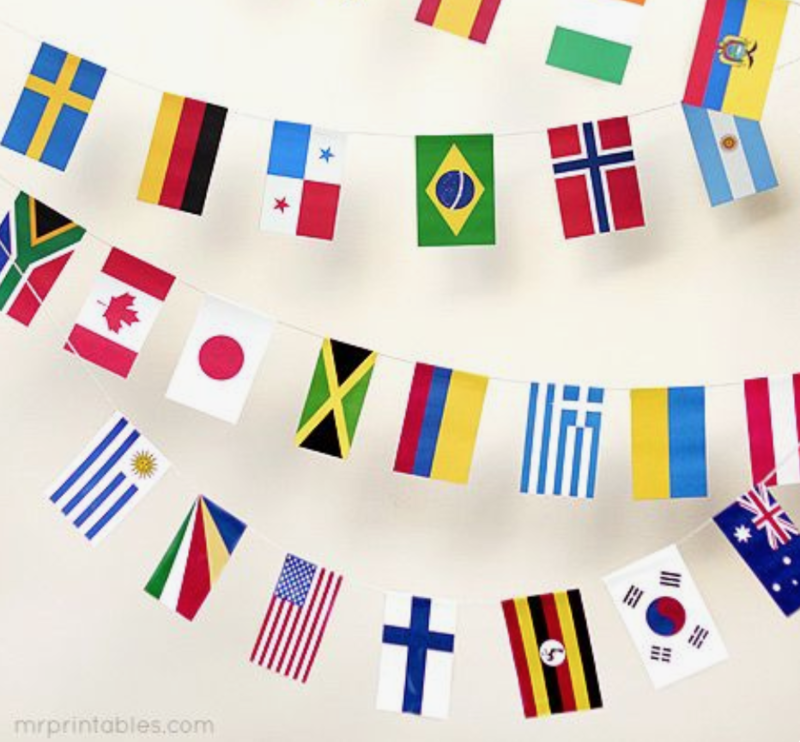 What a fun and informative way to discuss similarities and differences between cultures. 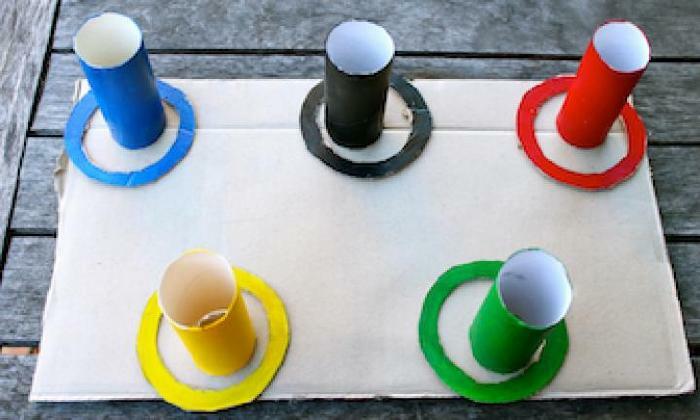 •	Try this super easy and quick way to make a ring toss game using just some cardboard and empty toilet paper holders along with markers or paint and some glue. Play for prizes or just play for FUN! 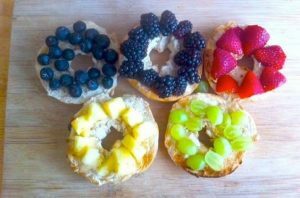 May all your adventures, whether Olympic in size or not, be inclusive, be rewarding and be FUN!